The multi-talented Cath Young lives on a few acres on the edge of a little town in the forest, and makes lovely things for her two unique labels - Chunky Chooky (softies for little treehuggers) and My Bearded Pigeon (through which Cath combines her love of all things old with her love of all things organic). Ophelia and Fenella Perriwinkle (AU $49.95 each) are two of Chunky Chooky's softie characters, available from her Etsy store. Apparently, among other things, Ophelia loves reading thick novels set in soviet Russia while Fenella likes rolling down hills and making herself dizzy. Both are made from certified organic denim with mock suete eye patches (upcycled from furniture upholsterys offcuts) and wool felt eyelids, and wear cotton dresses. Pictured above are a couple of cute rattle monsters which are available from Chunky Chooky's MadeIt store, (AU $26 each). With a loud rattles and wooden teething rings, Cath's creations are sure to delight little ones. I love the cycloptic twin-fanged monster - both scary and sleepy! Cath's cushions let you travel the world (and go back in time!) 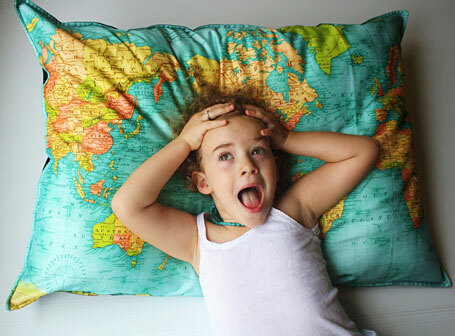 without leaving your loungeroom... Pictured above is the giant "Whole Wide World" pillow cover (AU $125) - ideal for your living room, a child's bedroom or even a preschool or primary school room! Here are a couple of places I'd love to visit! The cushion on the left features the white continent of Antarctica, surrounded by icy waters (AU $55, cushion cover only), and on the right is street map of the city of Portland, Oregon (AU $55, cushion cover only). Above left is a vintage map of home (Australia!, AU $55, cushion cover only), while on the right, a vintage map of our neighbours in the Pacific (AU $55, cushion cover only). Our hearts go out to the people of Japan. We can't begin to imagine what those affected by the earthquake and tsunami are going through at the moment. Cath will be donating $20 from the sale of this cushion to the Australian Red Cross Japan Disaster Relief Fund. 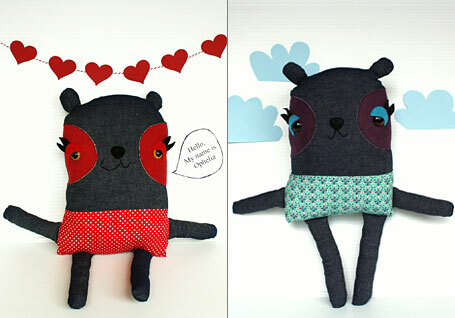 To discover more of Cath's creations, check out her blog at http://chunkychooky.blogspot.com.